Applesauce is a great healthy Smart Snack and side dish option for kids of all ages! Thanks to Musselman’s Apple Sauce for sponsoring this post. You’ve probably heard of the guidelines for healthy school lunches. But did you know there are also guidelines to help parents and teachers serve healthy snacks at school? I’m glad guidelines like this exist. A LOT of our kids’ daily calories come from snacks: 25%, according to one recent study! So it’s important to make those calories count by serving minimally-processed, nutrient-dense foods. Smart Snacks in School can guide you in choosing the right snacks for helping kids do their best in school and improve overall health. To qualify as a healthy snack that meets the Smart Snacks in School standards, snacks have to meet a couple of conditions. The first ingredient must be a fruit, vegetable, dairy product, or protein. And the food item must contain fewer than 200 calories, under 200mg of sodium, less than 35% fat, and less than 35% sugar by weight. Fresh, frozen, or canned fruits and veggies don’t need to follow the above rules because they automatically qualify as a Smart Snack in School. 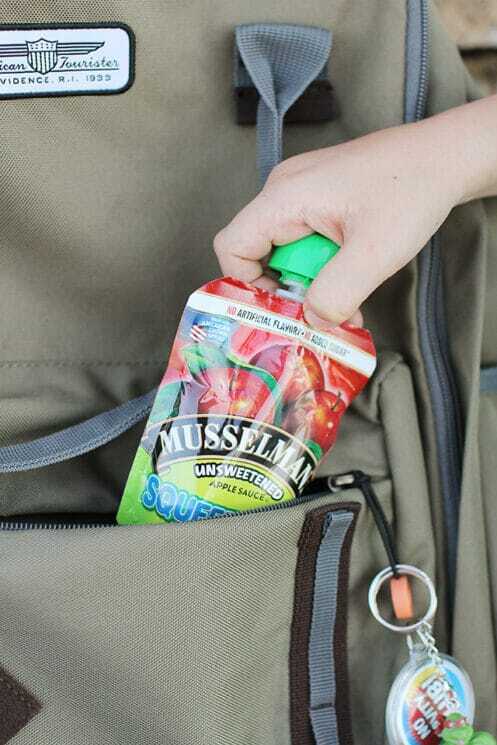 All-fruit squeeze pouches, like Musselman’s apple sauce squeezeables. If you send snacks to school every day, you know how easy it is to fall into a rut! So it helps to have more than a few options on hand that you know your kids like, and that satisfy the nutritional requirements growing bodies need. Apple Sauce Cups, and my kids love them. 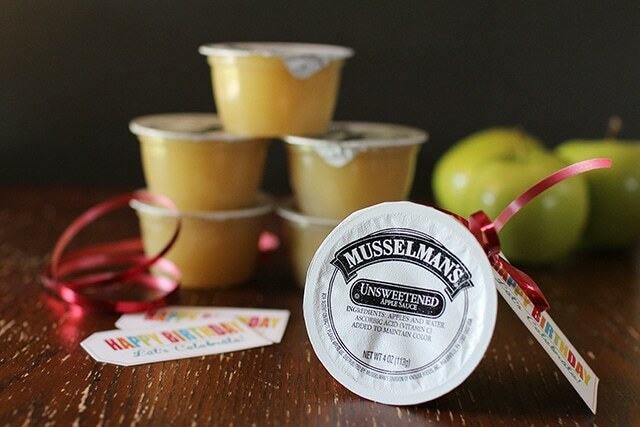 I trust Musselman’s because it’s made from 100% American-grown apples, with NO GMOs and NO added sugar! So many packaged foods and other applesauce cups and pouches contain high fructose corn syrup. Growing up, my mom used to make applesauce for us every fall during the apple harvest. I’ve been eating more than my share of applesauce since I was very little! Now that I’m grown, I love that my kids are fans of applesauce, too. Chunky, smooth, warm or cold: they eat it all! We love serving applesauce with dinner as a side dish and even as a ‘dip’ for meat. Eating sweet applesauce with salty pork chops is one of our favorite meals! Musselman’s Apple Sauce has a fresh, homemade taste we all like, and it saves me the time it would take to make applesauce for three growing kids. It’s super convenient, easy to pack, and it doesn’t need refrigeration. Healthy birthday treats: tie a little birthday tag around cups or pouches of applesauce, and bring enough for all the kids in class. It’s not messy like cupcakes, not sticky like candy, won’t stain the carpet like punch, and won’t ruin kids appetite for lunch. Holiday parties: draw a jack-o-lantern on the cup for Halloween, glue on a reindeer nose for Christmas, or tape a loving message to the top for Valentines’ Day. Letter-a-week: bring applesauce to class when preschoolers are learning about the letter “A” for a fun, healthy, themed snack. Midday snack: send applesauce cups for your kids’ daily snack time for a nutritious snack that’s easy to eat when there’s not a lot of time. Afterschool snack: Use applesauce squeeze pouches to make drops on a sheet pan. Freeze for 1 hour and your kids can enjoy frozen applesauce bites! School lunch: Make shelf-stable applesauce the fruit portion of your kids’ school lunches. 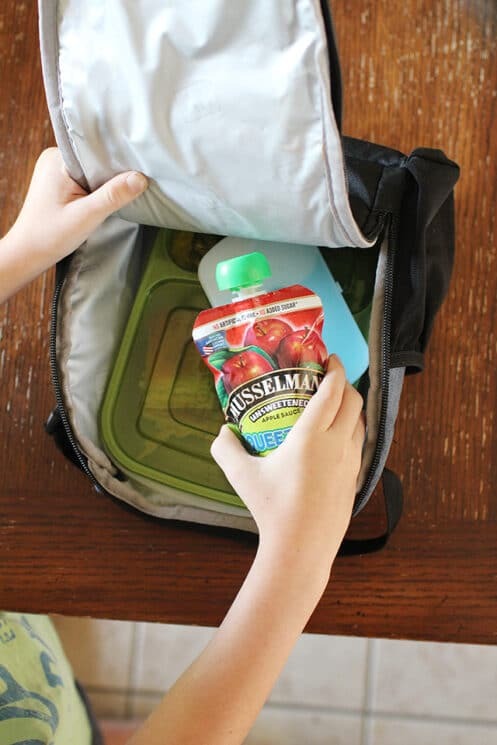 If you’re teaching your kids to pack their own lunches, you can keep a basket in your pantry filled with applesauce, dried fruits, pretzels, and nuts, and let them pack. 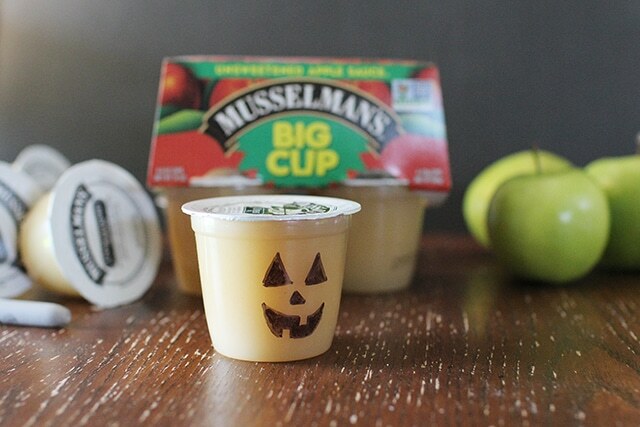 You can also freeze your Musselman’s Apple Sauce cups to add to your lunch to keep applesauce, as well as the other food, cold in your lunch. Join me in committing to sending simple, healthy, yummy snacks this year! : Keep your UPCs from Musselman’s sleeves and mail them in for FREE GAMES like “5 Second Rule”, or “Don’t Rock the Boat”. I love this website but it saddens me to see single-use plastics being promoted. I love the idea of applesauce, and understand the convienience of shelf stability, but we need to do better and focus more on a sustainable approach to convenience.